how great are pinafores? 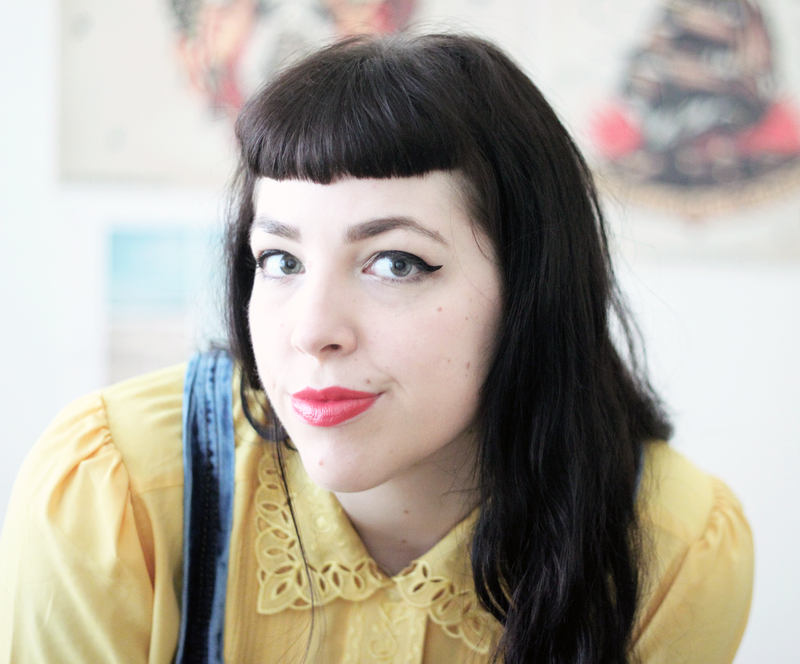 they're the most versatile item of clothing and it's the easiest way to get more wear out of all my shirts and blouses, including this pretty bright yellow one. it was given to me by a friend who originally op-shopped it. i happened to be over while she was cleaning our her wardrobe and decided she didn't want this anymore so i generously offered to take it off her hands. i love the scalloped collar detailing but really, the colour is what makes it. i think these shoes are sold out on ASOS now but i LOVE them. i almost always use black as my default colour when i need to add things like shoes or a belt to a colourful outfit, but when i'm wearing navy (not so relevant for this outfit, but in general) it's nice to have a pair of navy shoes instead of black. 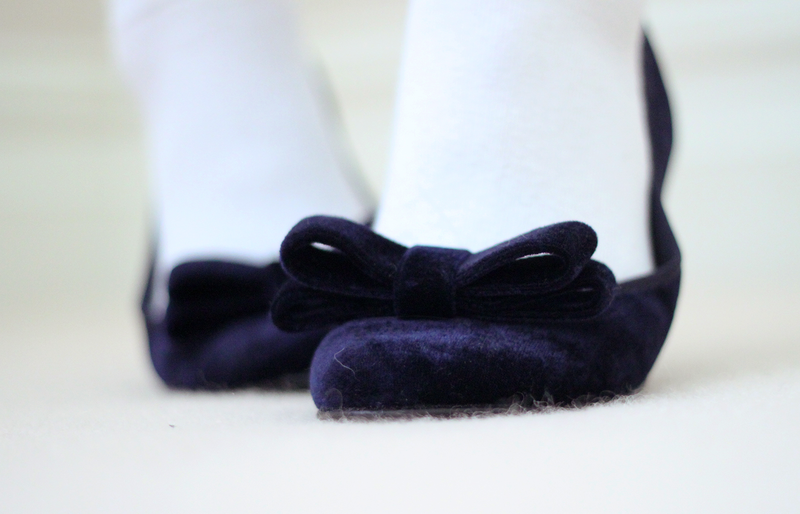 oh, and hello, they're velvet! i bought a black one first as well and i love it, but i decided i would definitely need a denim one as well! Oh pretty girl, that shirt is really wonderful! 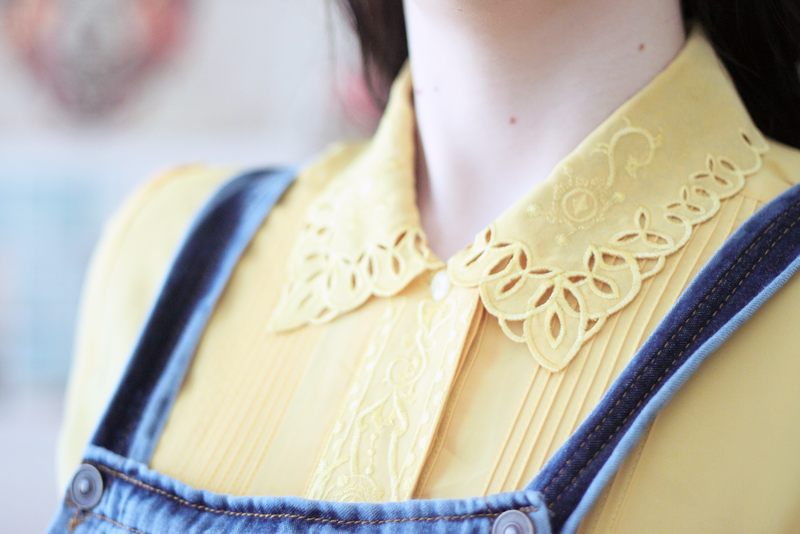 I love the combination with the pinafore. You pull it off so wonderfully, especially together with those darling shoes! I've been seeing pinafores everywhere lately! I should dig my very old one out of the closet soon. I love love love your hair! Aw you look so cheerful! 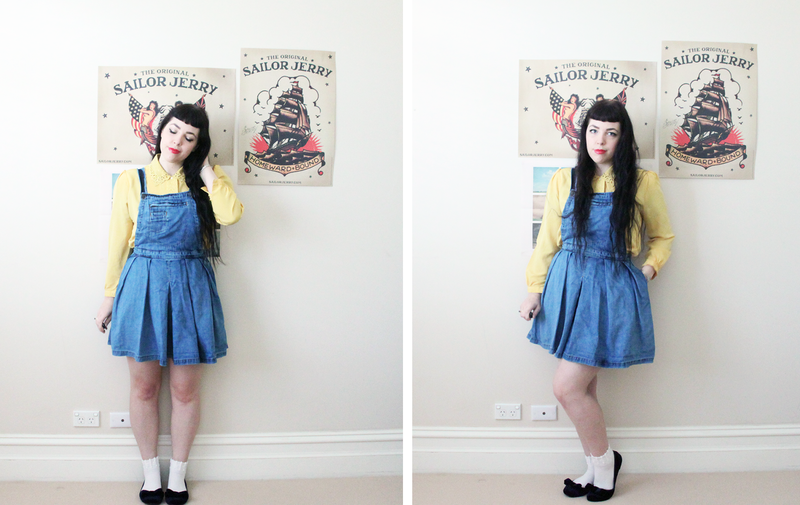 I've been on a lookout for a pinafore, for the exact reason that I'd get more wear out of my shirts in a cute way. Your flats are lovely too, I think I'd destroy a pair of velvet shoes so I'd better just admire them on you! haha aww, thank you! yeah pinafores are so great for that, i have lots of shirts but i get so bored of just wearing them with a plain black skater skirt so pinafores are the answer! What a terrifically sweet, charming, beautiful ensemble. I love how the soft, buttercup yellow makes the denim pop and vice versa. 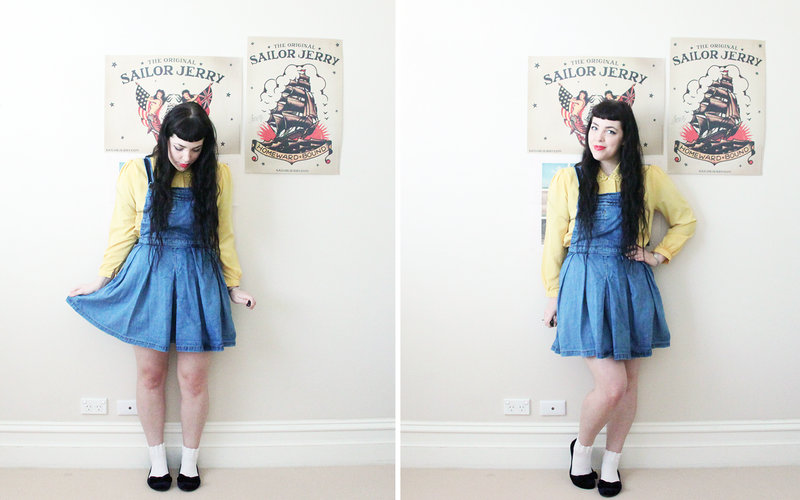 I'm on the prowl for a denim (or chambray) vintage or vintage style jumper (pinafore) dress myself, too. Freddies released a blue one earlier this year which fits the bill pretty well, and which I'm smitten with, but it would be quite the investment when the currency exchange and import are factored in, so for the time being I'm holding off on it (as much as I want it!). Those shoes are so very lovely! I have some suede heels, but no velvet ones at the moment. They really do impart such an air of rich glamour to any outfit. 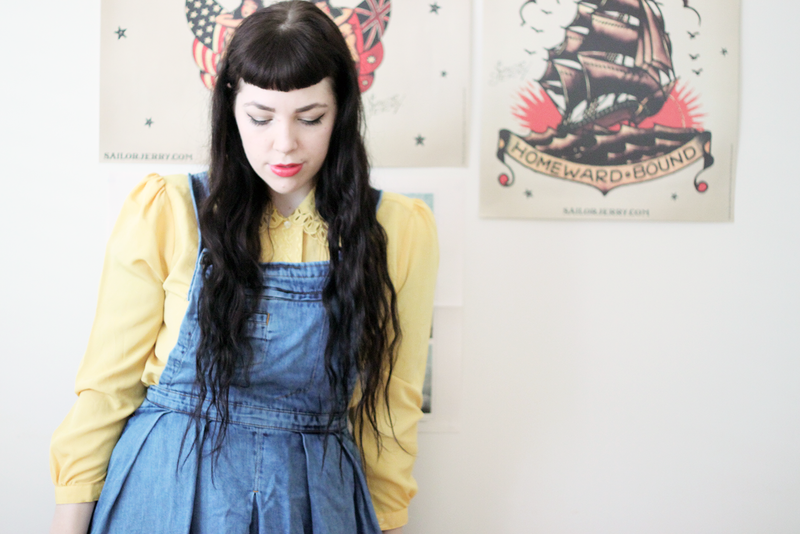 I TOTALLY share your pinafore love! I have a few I have been avoiding putting up in my etsy shop because I am (hoarding) them for myself! So comfy and easy and LOVE your yellow blouse underneath! ah, i love this yellow top here. yellow is the perfect color.. i need more of it in my closet! very cool and you have perfect hair! You have the cutest style! I haven't worn a pinafore since I was a kid, but bringing back elements of your childhood into your current style is so cool. I love how jelly sandals are back in, though I can't decide whether I should buy a pair for the summer or not! And velvet! ♥ You can never go wrong with velvet! completely agree, you can never go wrong with velvet! i've considered jelly sandals as well but i just don't know if it'd actually ever wear them. they are really cute though! That blouse is beautiful! I've been trying to find more blouses in general and it is slow coming. I'm quite jealous too of your ability to wear yellow. I've been on the lookout for a pale yellow as it seems to be the only shade that might work on my skin. Yours is perfect! It looks perfect on you! I also could not be able to pull it off at all. What a cute blouse, love the pattern design on the collar. You are too cute for words! Yellow is a great color on you, and your velvet flats are aaaaaaamazing! love the blouse. the details on the collar are too cute. Love the collar on that shirt, it's fabulous.